What a week-end it has been, we were officially hot for the first time this year! Poor Barney did alot of sighing and flopping about on the tiled floor trying to find a cool spot as wearing a very thick fur coat in 23 degrees is hard work!! So its Perfect Paws for him next week, he went 4 weeks ago but poor lad needs another trip for a new make-over. He did enjoy his trip to the Sherborne Castle Country Fair at the week-end where he managed to secure an Ostrich Burger from a Great Dane who had been momentairly distracted by a very flighty Yorkshire Terrier! We have been really busy over the last few weeks as you all loved the offer on the Standard Rollers. Don't forget it ends soon at the end of the month, so don't miss out. The Standard Roller pattern dragonflies are lovely and you can achieve a lovely flying stream of dragonflies across the paper by inking up the roller and when you roll it out over the paper make the pattern fly up and down, (just push the roller up hill and down dale, it is really easy), it looks fab - try it and see you'll be thrilled with this new way to use your roller. We will be featuring a card using this technique in the next few weeks. We decided that as the sun is now officially shinning and everyones' garden is coming into bloom it is time to use some of our beautiful range of botanical stamps in conjunction with the jumbo roller. We know how much you love the Ornate Border roller so we decided to combine it with the Shadow Rose Stamp, for a really rich card that would be perfect for lots of occasions. The card is so easy to do, the secret is to roll the Ornate border design across the card from left to right, rather than up and down and always check you are starting to roll from the same place on the roller. Often, using the join line is a great starting point. This one has been heat embossed with our own new Magi-Boss Ultra Fine Gorgeous Gold embossing powder. These are a new range of powders that we are trialling at the moment and we will be going live with them any day now! We have been perfecting the range and we are thrilled with the beautiful smooth glowing effects that can be achieved with these powders. 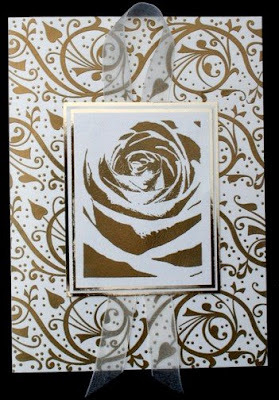 We inked up the Imagination Shadow Rose stamp using Versamark and embossed this using the Gorgeous Gold Magi-Boss and by matting and layering the image onto cream gold pearlescent card and bordering with gold mirri card the composition of the card is really complimentary. Don't forget to put the piece of gold organza ribbon onto the card before you stick the Rose image down on top of it. ©Imagination Crafts 2000-2016. Simple theme. Powered by Blogger.